Sumptuously furnished with feature bed + electric blanket, plus futons +memory foam toppers, everything for self catering included right down to an ice bucket, slippers, eye masks, ear plugs, toiletries in modern showers. Own BBQ + gas stove + fire pit. Complimentary goodies in the kitchens with fridges, ice machine, toaster, microwave, tea urn. Sumptuously furnished with 7ft round bed + electric blanket, plus futons +memory foam toppers, everything for self catering included right down to an ice bucket, slippers, eye masks, ear plugs, toiletries in modern showers. Own BBQ + gas stove + fire pit. Complimentary goodies in the kitchens with fridges, ice machine, toaster, microwave, tea urn. East Sussex is far from lacking in the scenic stakes. 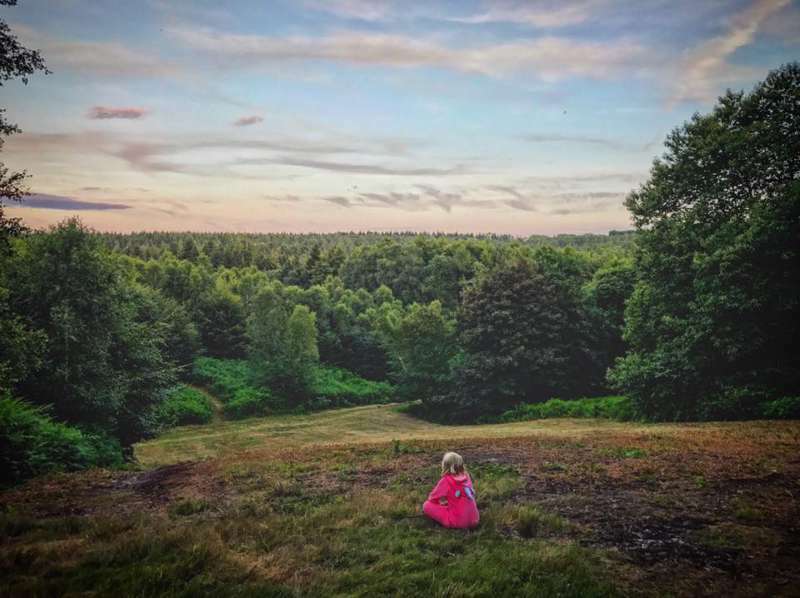 From the magical woodlands of the Ashdown Forest, to the atmospheric ruins of Battle Abbey, and the picturesque seaside towns of the south coast. 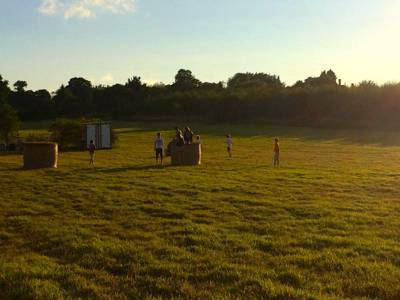 You're sure to find endless activities, perfect for romantic weekend in the wild, or a fun, family break with the kids. 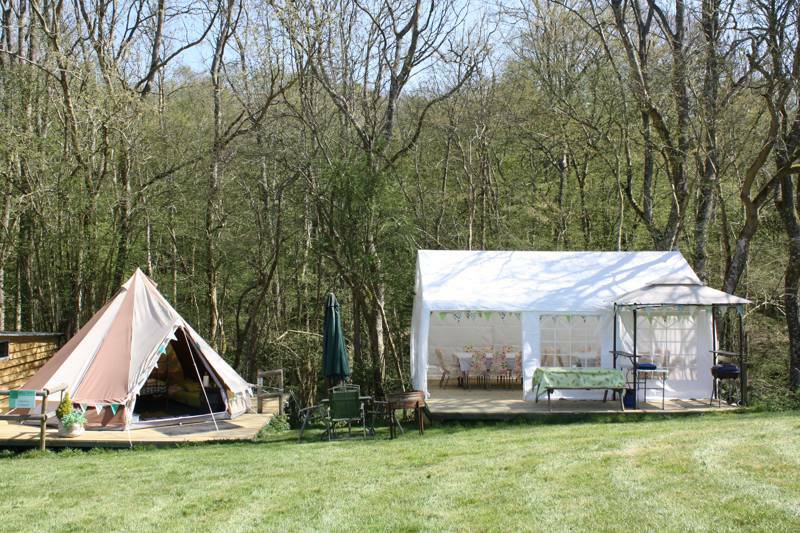 It’s in this diverse landscape that you’ll find Woodside Yurt & Breakfast, a luxury camping operation nestled between rolling countryside and an idyllic, ancient bluebell woodland. If you need to get away from it all, Woodside is hard to beat for some good old fashioned peace and quiet. 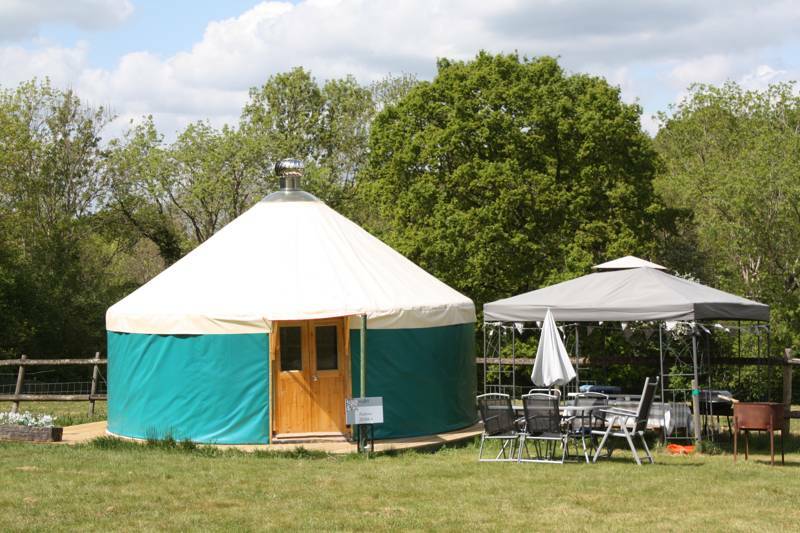 There are three yurts and five 'soulpad' tipis, all located in one of the site's two peaceful paddocks. Inside, the yurts are fully insulated and delightfully homely, with heating, electric and a relaxing, candle-lit atmosphere. There’s a comfortable feel to the soulpads too, however you’ll need to bring bedding or sleeping bags, or these can be hired from Amanda, your welcoming host. As mentioned, there’s plenty of exploring to be done. Home to medieval villages, patchwork hills, and dramatic coastline, East Sussex becomes besieged by weekenders whenever the sun comes out to play. It's not hard to see why as you explore the fairy tale Bodiam Castle (complete with moat & drawbridge! ), wander historic Battle, where William the Conqueror first took on the Saxons in 1066, and discover “England’s quaintest town”, Rye and its nearby sandy dunes at Camber Sands. Yes, there are plenty of fascinating attractions nearby, but we suppose rushing around isn’t really the point of a break here. Guests can kick back by taking advantage of the sites fantastic health suite, with hot tub, sauna, beauty, massage and spa treatments. 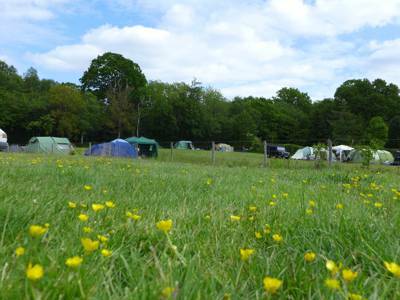 After all that pampering, all that's left to do is take in those wonderfully peaceful woodlands, chill out by your cosy yurt and, of course, devour one of those locally renowned (and award winning) breakfasts. Woodside Yurt & Breakfast; probably the world's most appropriately named campsite. We are opening this year for our 9th Season, and this year is going to be our best yet. here at Woodside we provide a bespoke service for all our Guests. 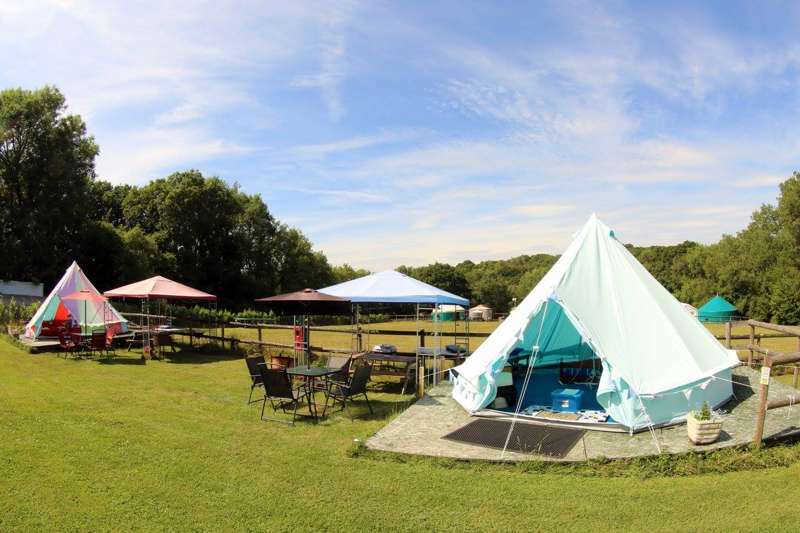 We have 10 accommodation ranging from Giants Yurts, Small Yurts and Bell Tents. Our aim is to make sure that you have the best time, so if you want to disappear for a few days away from the World or do as much as possible the option is all yours. Our Accommodation are beautifully decorated with Beds and Futons, Furniture and everything that you would need for self catering. Linen and Towels are included, along with slippers, eye masks and eye plugs (4am dawn chorus!!!) Outside you will have your own seating area, gazebo, BBQ and fire barrel. Marshmallows are a must for roasting over the fire. In the house we have Beauty Rooms where our in house Beautician Angel will pamper you with Spa and Beauty Treatments, our Health Suite with Hot Tub and Sauna can be reserved for a private hour. We have electric points where you can recharge phones, laptops, kindles and ipads. 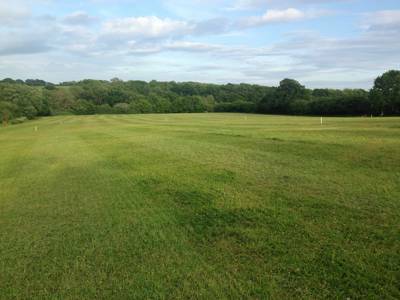 The Site is surrounded by Ancient Woodland and has a stream running though it that is the boundary for our land. 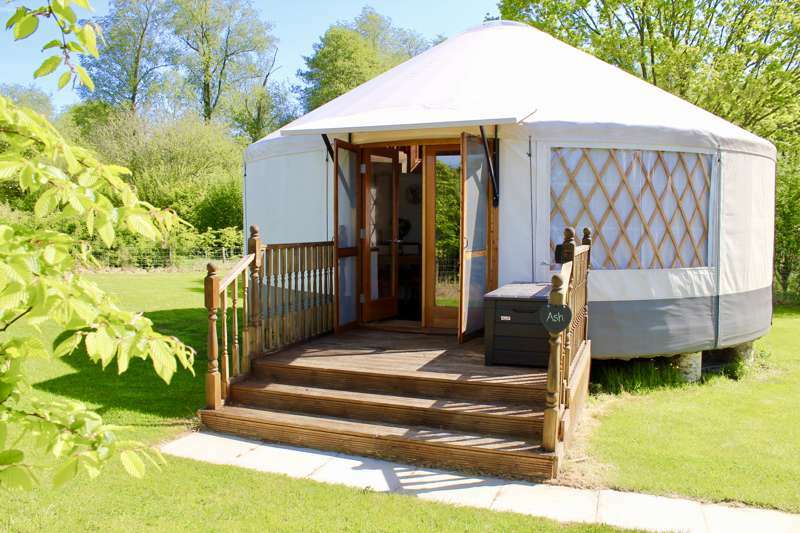 We booked the Mammoth Mongolian for a long weekend, the Yurt was Beautiful and as a girl who likes her creature comforts I was very happy with the Glamping facilities. It was clean, tidy and very well brought together. The staff where very approachable and willing to help us with any of our wants and needs. The food was particularly yummy and the breakfast was AMAZING! we could order extras like the surprise champagne and strawberries my amazing husband surprised me with at breakfast :) I also enjoyed a beautiful massage from the beautician called angel - the name highlights her abilities I was in heaven to finish it all off we booked the private Jacuzzi it was a perfect weekend and now I want to go back. 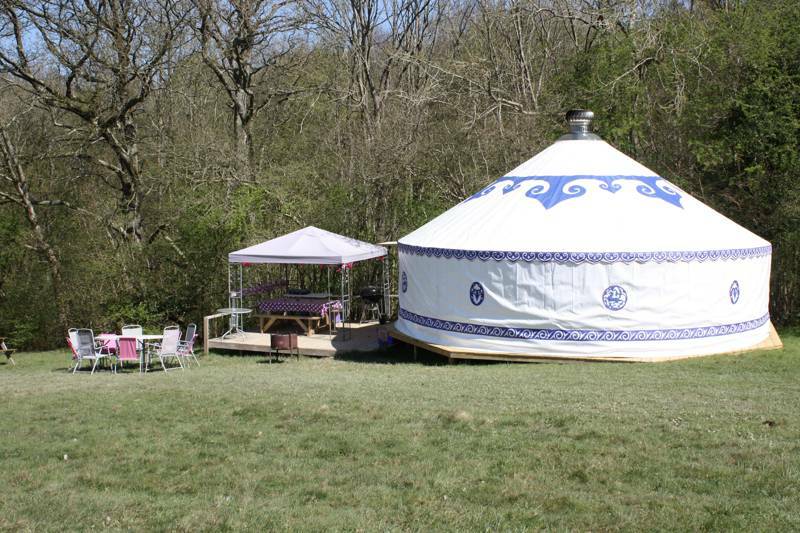 2 luxury yurts (sleep 4–8); 2 animal themed yurts (sleep 2–5); 1 yurt in the woods and 5 themed bell tents (sleep 2–4). 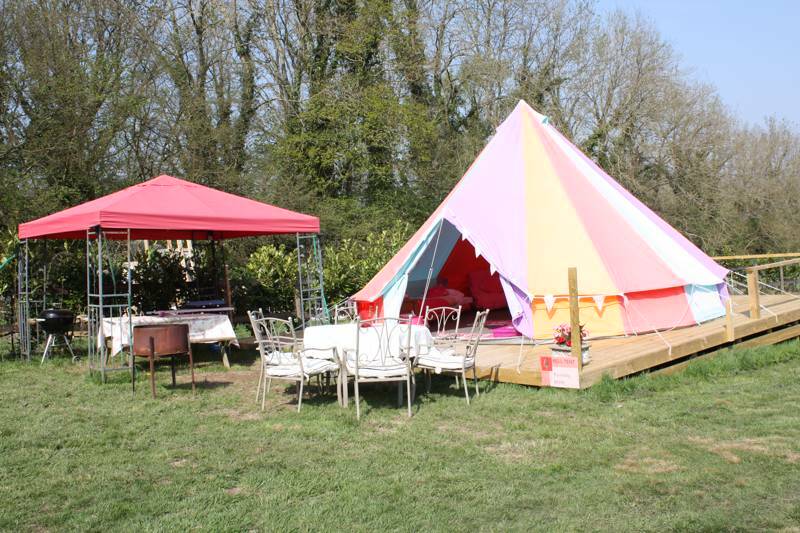 Glampers, couples, groups, exclusive hire and kids – yes. 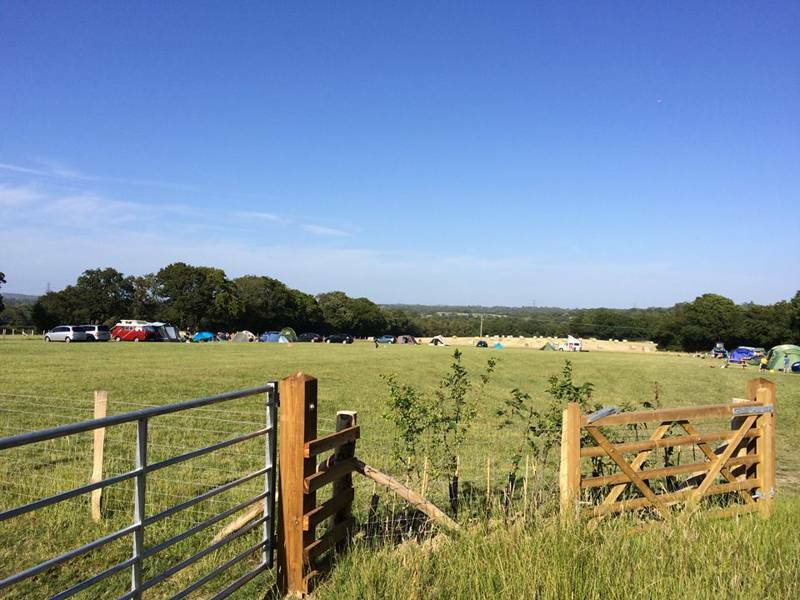 Tents, caravans, motorhomes and dogs – no. All accommodation in uniquely furnished, themed and finished. Inside, expect the likes of double beds, futons, wardrobes, table and chairs, pots, pans, crockery, cutlery, utensils and glassware. Linen, towels and bedding are all provided. Outside each there is a gazebo, with a cooking area, charcoal BBQ and some also have small fridges with electricity. Modern electric showers in 2 portable cabins, toilets, laundry service (available at a charge.) Charging points for mobile phones etc are in the main house. Health suite with hot tub & sauna, spa, beauty & massage therapies, reiki and reflexology. Wi-Fi, 9ft cinema screen, guests lounge and woodland walks. The fishing port of Hastings and its Old Town (15 minutes) offers plenty of fun for the family including: the chance to spot sharks and rays at the Blue Reef Aquarium and Smugglers Cave, where you can discover the secrets of smugglers buried deep in the heart of Hastings' West. And whilst you're close to the water, you might as well get wet at Bewl Water, which offers a host of water-based activities including fly-fishing and key water sports. If you're planning on bringing a bike, pop over to nearby Bedgebury Forest for some off-road biking to suit all capabilities. Sedlescombe and Carr Taylor vineyards are only few minutes away, with visitors being able turn up and enjoy the gorgeous countryside, or come en masse for a tutored tour & tasting session. Often described as “England’s quaintest town”, Rye (15 minutes) feels like a little piece of the past and makes for a splendid day out. Even the most hard-boiled cynics can't fail to be softened by Rye's secretive passageways, cobbled lanes and half-timbered Tudor architecture. Just out of town is Rye Harbour Nature Reserve which plays host to an impressive array of coastal birds, frogs and beetles. Entry is free. The site has a ‘Breakfast Award’ and guests can order anything from a full English to eggs Benedict, smoked salmon, haddock, homemade smoothies and pancakes with maple syrup and banana. Also on offer are ‘Vintage Tea Parties’ with sandwiches, scones, profiterole towers, cupcakes and seasonal fruit served with a variety of teas and decorated jugs of Pimms. Woodside also supply local, organic and free range products to glampers from the kitchen on pre-order basis. A complimentary beverage area is also provided with free instant coffee, tea cakes and more. Offsite, there’s plenty of local eateries to fill your belly. Grab an afternoon drink at the Cross Inn in Staplecross, a classic old drinkers’ pub, and full of local characters. To treat someone special (or yourself), check out the Curlew restaurant in Bodiam a Michelin star gastro delight, with a varied menu and extensive wine list. The Castle Inn opposite Bodiam Castle offers good value food served in generous portions. The terrace overlooks a big field which also acts as a play area for little ones. 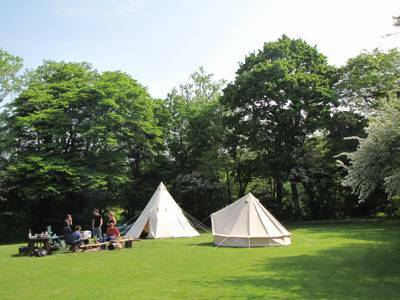 Bell tents from £80 per night (Mon-Thurs, 2 night or more stays) and from £85 per night (Mon-Thurs, 1 night stays). 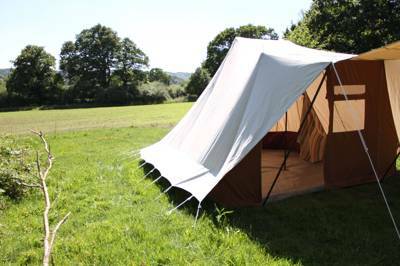 Bell tents from £90 per night (Fri-Sun, 2 night minimum generally applies). 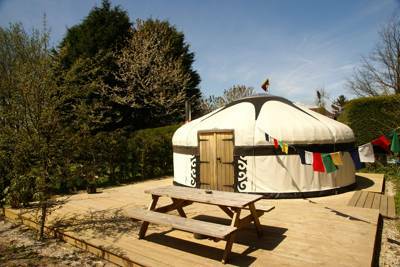 Yurts from £90 per night (Mon-Thurs, 2 night or more stays) and from £95 per night (Mon-Thurs, 1 night stay). 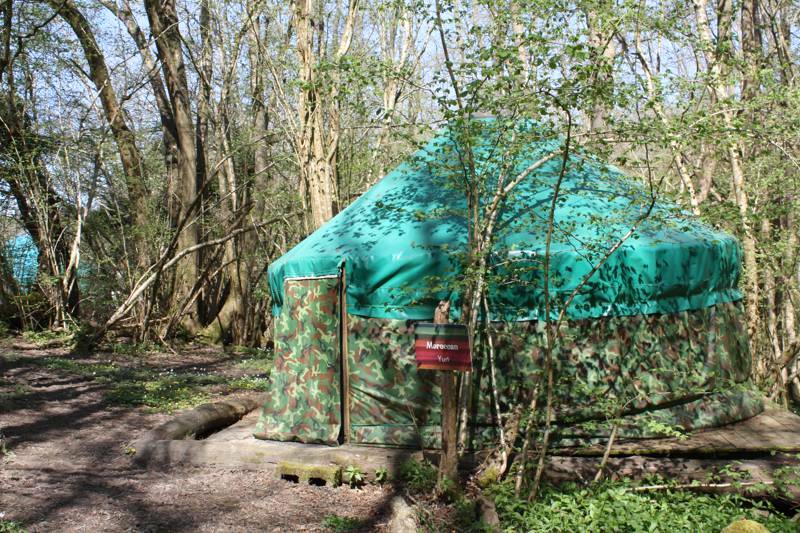 Yurts from £100 per night (Fri-Sun, 2 night minimum generally applies). From Flimwell (heading towards Hastings): carry straight along the A21 through Hurst Green, when you see the White Horse Pub on the right, take the turning diagonally opposite on the left towards Bodiam. Follow this lane until you get to the crossroads with The Curlew Pub on your left. Turn right and drive for about 3 minutes passing 2 narrow bridges; in the distance you will see an arch going over the road, Woodside can be found 100 meters before the archway, on the left hand side, marked by a yellow and white fluorescent post. From Battle: head towards the north end of the town and at the roundabout, take the diagonal right hand turn and follow the road until you meet the A21 at a large roundabout. Turn right, towards Hastings, and follow the road past Vine Hall School on the right, take the next left signed towards Rye and Cripps Corner. Follow the road to the cross roads with the White Hart on your right, turn right and you will come to a "T" junction in 100 meters. Turn right and drive under the archway that goes over the road, Woodside can be found 100 meters after the archway on the right hand side. 1¼hrs by train from London Bridge/Charing Cross on the Hastings line; get off at Robertsbridge, which is an 8 minute drive away. Amanda is more than happy to meet you there, and help run you around during your stay, for a minimal charge.